Are your customers continually changing box sizes? Is increased egg grader speed driving the need for higher case sealer throughput? With the LD-16AE, eye sensors identify cartons with the flaps in the up position, and the head automatically adjusts to each box height for precision sealing at a rate of up to 17 cases per minute. 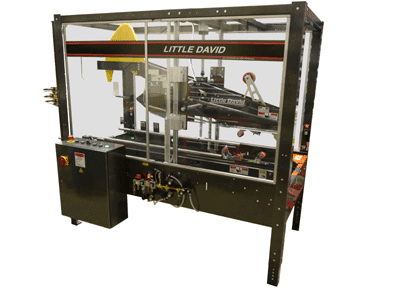 Each machine is constructed to match your specific box range with the ability to program new sizes using our handheld controller. Loveshaw has provided this type of machine specifically for the egg industry for over 20 years, and it is the ideal solution to randomly seal a limited number of cases without the expense of a fully automatic machine. Available with bottom belt drive or side belt drive. 110 volts – 1 phase +/- 10% AC 60 Hz. End-User is responsible to supply a 115 volt AC 20 amp circuit for the system.